Home » GBP » US Dollar to Pound Exchange Rate Forecast: Are USD/GBP Gains ahead on Fed Chair Testimony? US Dollar to Pound Exchange Rate Forecast: Are USD/GBP Gains ahead on Fed Chair Testimony? in GBP, USD, USD to GBP. The US Dollar (USD) has shaken off yesterday’s losses and risen by 0.5% against Pound Sterling (GBP) today. This noticable turnaround follows comments from Federal Reserve Chair Jerome Powell which have boosted the US currency. Mr Powell has raised confidence among USD traders during testimony, by stating that a continued path of interest rate hikes is likely. The US Dollar (USD) has struggled against the Pound (GBP) today, in the wake of a damning report on the US’s trading future. The International Monetary Fund (IMF) has warned that the US could face ‘global retaliation’ from other nations because of its trade tariffs. The IMF report states that the US is ‘especially vulnerable’ to any counter-tariff efforts; this has kept the USD/GBP exchange rate firmly in check today. The US Dollar (USD) has made minor losses against the Pound (GBP) today, despite the news that US retail sales continued to grow in June this year. These results have left the USD/GBP exchange rate trading at £0.7545 today, which is near a one-week low for the currency pairing. 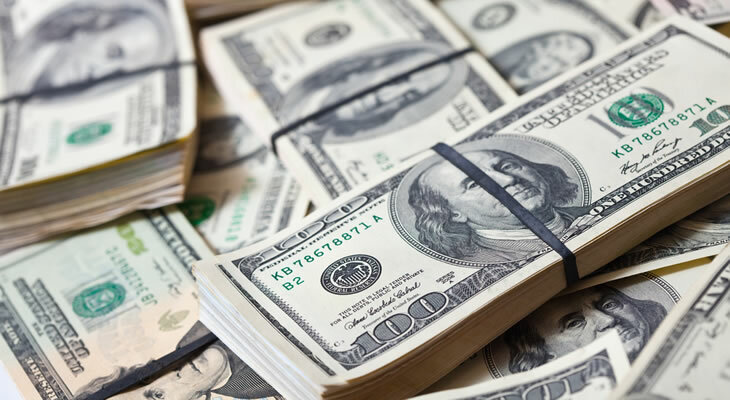 There could be a US Dollar to Pound (USD/GBP) exchange rate recovery this week, when Federal Reserve Chair Jerome Powell speaks on Tuesday and Wednesday. Mr Powell will be testifying to the Senate Banking Committee on Tuesday and the House Financial Services Committee on Wednesday and could discuss monetary policy. This pertains to areas like interest rates, which some USD traders believe are on track to rise twice more in 2018; there were prior rate hikes in March and June this year. If Mr Powell hints at another rate hike as early as the Fed’s next meeting on 1st August, the US Dollar could rally against the Pound because of boosted trader expectations. On the other hand, if Mr Powell downplays expectations for higher interest rates then the USD/GBP exchange rate could tumble. Will UK Wage Growth Data Trigger Pound to US Dollar Exchange Rate Decline? The Pound (GBP) could lose its current gains against the US Dollar (USD) on Tuesday morning, when high-impact UK jobs market data will be released. There will be a variety of data on display, but GBP traders will be focusing on the May’s unemployment rate and wage growth data. The jobless rate isn’t expected to change from 4.2%, while the pace of wage growth with bonuses included is tipped to slow from 2.8% to 2.7%. These outcomes aren’t set in stone, but if they print as forecast then the Pound might slip against a stronger US Dollar. On the other hand, if the jobless rate unexpectedly falls and an acceleration of average earnings growth is reported then the GBP/USD exchange rate could improve. Is GBP/USD Exchange Rate Advance ahead on UK Inflation Rate Data? Looking beyond Tuesday’s UK jobs market data, the Pound to US Dollar (GBP/USD) exchange rate could also be affected by UK inflation rate stats out on Wednesday. The year-on-year figure is predicted to show a faster pace of price growth during June 2018 compared to 2017, with an acceleration from 2.4% to 2.6%. This is considered a more important result than the month-on-month reading, which is conversely anticipated to slow from 0.4% to 0.2%. If both readings show price growth then the Pound could rally against the US Dollar, although this is partly dependent on how Tuesday’s wage growth figures print. Higher inflation goes hand in hand with higher wage growth when considering the odds of a Bank of England (BoE) interest rate hike. Essentially, if the pace of wage growth and inflation both rise then a BoE interest rate hike is more likely, which could inspire a Pound to US Dollar exchange rate rise.